Encompasses all mathematical optimization methods and algorithms relevant to engineering. Optimization and Engineering promotes the advancement of optimization methods and the innovative application of optimization in engineering. 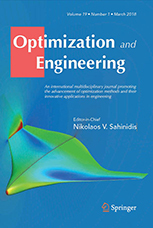 It provides a forum where engineering researchers can obtain information about relevant new developments in optimization, and researchers in mathematical optimization can read about the successes of and opportunities for optimization in the various engineering fields. We encourage the submission of manuscripts that make a genuine mathematical optimization contribution to a challenging engineering problem.